This is an amazingly cute book with an important message! I absolutely love books that share important messages with children because they really seem to stick with kids. When important messages and life lessons are shared though a book kids seem to remember them much better than just being told why or why we don't do things by mom and dad. 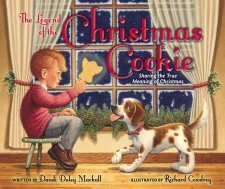 The Legend of the Christmas Cookie is a story about a boy named Jack who's family is barely scraping by. One day Jack sees his mom making cookies but is only disappointed when he learns they are for the poor people at church and he cannot have any. His mother saves one cookie and gives it to the little boy on Christmas morning. Suddenly there's a knock at the door and it's someone needing some food and so Jack takes this opportunity to give them his only cookie. It is through that cookie that he is able to share about Jesus and tell about the Christmas story. The Legend of the Christmas Cookie is beautifully written and the illustrations throughout the book are equally beautiful. My kids enjoyed reading this book and I highly recommend it! To Learn more about the author and view her other books click HERE!